"Outside, the moan of the tortured thousands shuddered up to the stars which crusted the sweating Vendhyan night, and the conchs bellowed like oxen in pain. In the gardens of the palace the torches glinted on polished helmets and curved swords and gold-chased corselets. All the noble-born fighting-men of Ayodhya were gathered in the great palace or about it, and at each broad-arched gate and door fifty archers stood on guard, with bows in their hands. But Death stalked through the royal palace and none could stay his ghostly tread." 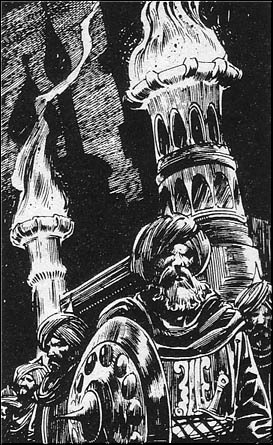 -- Robert E. Howard: "The People of the Black Circle"
Vendhya is a land of ancient gods and jewels. Vendhya is a roughly triangular peninsula lying between Kosala and Khitai, south of the Himelian mountains. Vendhya is tropical, with wide expanses of untamed jungle. Vendhya is a fertile land, except in the stony regions of the Himelian foothills. Vendhya's agriculture is well-developed, and there is also a thriving industry of silk and woven products, especially carpets. In the north, mines provide copper, silver, gold and iron; the southern coast, however, has poor seaports, making most of Vendhya's trade overland. Vendhya's jungles provide a variety of fascinating life. Elephants, tigers, panthers, cheetahs, gazelles and gorillas can be found, and beautifully colored birds fill the trees. Yaks and oxen wander through the highlands of the north, and some have been domesticated by the hill peoples. Vendhyan products include herbs, spices, sandalwood, jade, mother-of-pearl and other natural substances worked into intricately carved pieces of distinctive beauty. Vendhya is also the source of several drugs, including various forms of lotus blossom. Vendhya is a stratified society, much like Turan, only older. Heading the kingdom is the ruler/scholar caste, the Brahma, made up of the nobility of the original invading Hyrkanian tribes; below them is warrior caste, or Kshatriyas, also of Hyrkanian descent who rule and serve in the armies; below them lie the craftsmen and townsmen, called Vaisyas, who provided the backbone of the Vendhyan manufacturing economy; and finally, the Sudra, or peasants, the most populous caste. Below all lie the Untouchables, Vendhyans whose lowly birth leaves them with the task of cleaning up garbage and corpses. In theory, birth determines caste. In practice, over the millennia of the Vendhyan civilization, there has been so much interbreeding that there is little outward distinction between the members of the various castes. All Vendhyans have light brown skin; they tend to be short and stocky, with round heads. The Kshatriyas tend to be more slender than average for a Vendhyan, with a characteristic hooked nose. The Vendhyans are well versed in the arts of treachery and double dealing. It is said that every Vendhyan spies for at least two others, and often for more. Their treacheries, however, are less devious than those of Khitai; the Kshatriyan code of honor remaining from their Hyrkanian origins deplores direct lies, and most Vendhyan deception consists of the "truth not told", or the careful shading of words to give impressions, without actually lying. Spying, per se, is not considered treachery; the Vendhyans themselves know it goes on, and it makes the sharing of a secret all that more meaningful in Vendhya. "The whole truth is a gift for your dearest friend alone", says the Vendhyan proverb. Vendhyans worship their own pantheon of gods. There are many holy men among the Vendhyans who travel from village to village, demonstrating their mystic power to the gathering crowds and performing strange feats for all to view. The villagers pay what they can for these miracles as a sign of respect for both the men and the gods they represent. They believe some holy men to be nature spirits, who walk among men to inspect the human domain. The Vendhyans worship both the Elder Gods of the Earth and Heavens and the Gods of the Other Worlds. Foremost of these is the god Asura, who teaches that all beings reincarnate, and that the purpose of life is the paying of the karmic debt against the soul. Each evil act extends the cycle of reincarnation; each good act shortens it. Other gods include Hanuman, whose children are the great apes of the jungle, Ganesha, the great elephant god, and Kali, who drinks human blood and feeds on living hearts. One of the most disturbing customs of the Vendhyans is the requirement that noble women must be burned alive on their husbands' funeral pyres to demonstrate their devotion to their husbands in death as well as life. Vendhyans are allowed many wives, but only the first wife is required to engage in this practice.